New month, new market? I hope not. All told, November turned out to be a stellar month for the stock market. The S&P 500 gave investors total returns of 4.4% for the calendar month, performance that doesn't sound all that outrageous until you consider the fact that it actually annualizes out to 72.2% gains if it kept up for the next 11 months. That breakneck price performance for the last month has the calendar rolling over to December on a high-note. All of the major stock indices managed to make new highs in November, which, simply put, means that just about any long-term stock market investor is sitting on gains right now. That's a very good thing for equity market sentiment. Just as importantly, stocks are looking well-positioned for more upside in December. As I write, some of the biggest names on Wall Street are teetering on the edge of breakout territory. To take advantage of that bullish positioning, we're turning to the charts for a technical look at five big stocks that are breaking out. First, a quick note on the technical toolbox we're using here: technical analysis is a study of the market itself. Since the market is ultimately the only mechanism that determines a stock's price, technical analysis is a valuable tool even in the roughest of trading conditions. Technical charts are used every day by proprietary trading floors, Wall Street's biggest financial firms, and individual investors to get an edge on the market. And research shows that skilled technical traders can bank gains as much as 90% of the time. Every week, I take an in-depth look at big names that are telling important technical stories. Here's this week's look at five big stocks to trade. Oil stocks rallied hard Wednesday. Crude prices were up more than 8% by the time the closing bell rang in New York, and along with it came stock prices for the entire energy sector. One of the notable winners was oilfield service giant Schlumberger (SLB - Get Report) , a stock that enjoyed more than a 5% rally of its own on Wednesday. That up-move in Schlumberger, a holding in Jim Cramer's Action Alerts PLUS portfolio, was enough to shove this $115 billion energy stock's total returns to almost 23% for 2016. Don't worry if you've missed out on that recent upside in SLB, however. This stock looks ready to kick off a second leg higher this fall, following yesterday's price move. Schlumberger is currently forming a textbook example of an ascending triangle pattern, a bullish continuation setup that signals higher ground ahead in this stock. The pattern is formed by horizontal resistance up above shares (at $84, in the case of SLB), and uptrending support to the downside. Basically, as Schlumberger slingshots in between those two technically important price levels, it's been getting squeezed closer and closer to a breakout through that aforementioned $84 resistance level. Shares finally closed slightly above $84 in yesterday's session. At this point, the breakout is a little too small to be considered material, but some continuation in today's trading session would provide enough confirmation to make SLB a buying opportunity. If you decide to pull the trigger on the Schlumberger trade, the 200-day moving average looks like a logical place to park a protective stop. We're seeing the exact same price pattern in another commodity-centric mega-cap stock right now: mining giant BHP Billiton (BBL . Like Schlumberger, BHP Billiton is showing off a pretty textbook example of an ascending triangle pattern; the key difference here is that BHP's price pattern is shorter-term. 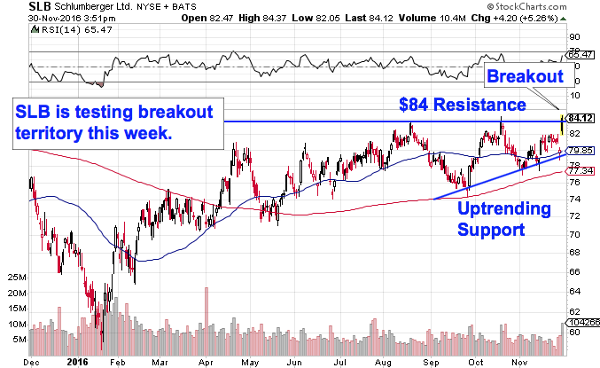 Investors should be on the lookout for a meaningful breakout above $34. In a nutshell, here's why the ascending triangle pattern works: the $34 resistance level is a price where there has been an excess of supply of shares. In other words, it's a spot where sellers have been more eager to step in and take gains than buyers have been to buy. That's what makes a breakout above $34 so significant - the move means that buyers are finally strong enough to absorb all of the excess supply above that price level. And which that barrier to upside out of the way, shares are free to move higher. Don't get thrown off by all of the gaps on BHP Billiton's price chart - those gaps, called suspension gaps, are caused by overnight trading in shares on the London, Australian, and Johannesburg stock exchanges. Those gaps can be ignored for trading purposes. There's a triangle of a different sort shaping up in shares of $112 billion payment network MasterCard (MA - Get Report) . After rallying nearly 20% off of its July lows, MasterCard has been consolidating sideways, bleeding off some overbought momentum as buyers and sellers battled it out. Now, shares are potentially closing in on some direction. MasterCard has been forming a symmetrical triangle, a continuation pattern that's formed by a pair of converging trendlines. The buy signal comes on a push through that upper blue line on the chart, currently just above $105. Consolidation patterns like the symmetrical triangle are common after big moves like the one we've seen in recent months and give investors a chance to catch their breath and figure out their next step. Since the pattern in MA was preceded by an uptrend, shares are statistically more likely to exit the price pattern to the upside, too. Meanwhile, the constricting action of MasterCard's symmetrical triangle is setting shares up for a volatility squeeze. Since volatility is cyclical, periods of very low volatility are typically followed up by a swing to high volatility. And as shares move into the tighter range of this pattern, the exit is likely to be fast - keep a close eye on MasterCard from here. The break above $105 is the signal that it's time to buy. Hewlett Packard Enterprise (HPE - Get Report) , the $40 billion tech spinoff, is having a great year so far in 201. Since January, this stock, another Action Alerts PLUS holding, has seen its share price rally more than 56%. The good news is that you don't need to be an expert technical trader to figure out the price action in this stock. 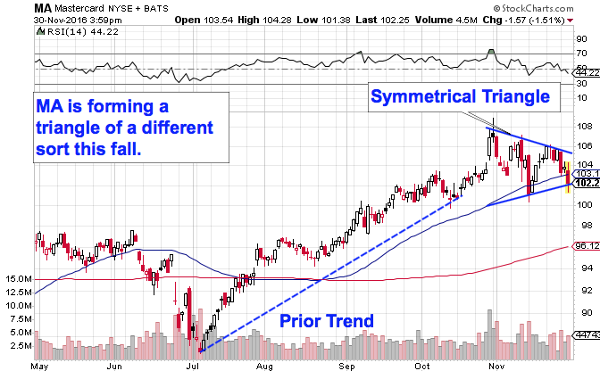 Instead, the pattern in play here is about as simple as it gets, and it's signaling more upside in HPE this year. 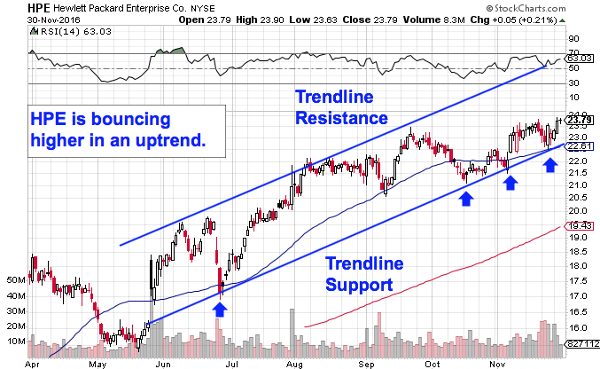 HPE has been in an uptrending channel since the end of the summer, bouncing its way higher in a well-defined trading range. The channel is formed by a pair of parallel trendlines that have done an impressive job of corralling this stock's price action so far. Put simply, every test of the bottom of the channel over that uptrend period has provided a low-risk, high-reward buying opportunity in HPE. So, as shares touch that same support level for a fourth time here, it makes sense to buy this week's bounce higher. Actually waiting for that bounce is important for two key reasons: It's the spot where shares have the most room to move up before they hit resistance, and it's the spot where the risk is the least (because shares have the least room to move lower before the channel breaks, invalidating the upside trade). Remember, all trend lines do eventually break, but by actually waiting for the bounce to happen first, you're ensuring Hewlett Packard Enterprise can actually still catch a bid along that line before you put your money on shares. Rounding out our list of big-cap breakouts is club store retailer Costco Wholesale (COST - Get Report) . Costco hasn't exactly been faring fabulously lately. Shares are down more than 11% since they peaked back in August, and Costco is underperforming the rest of the S&P 500 by a big margin year to date. The good news is that long-suffering shareholders could be in store for a reprieve thanks to a classic bullish reversal pattern that's finally forming in shares. 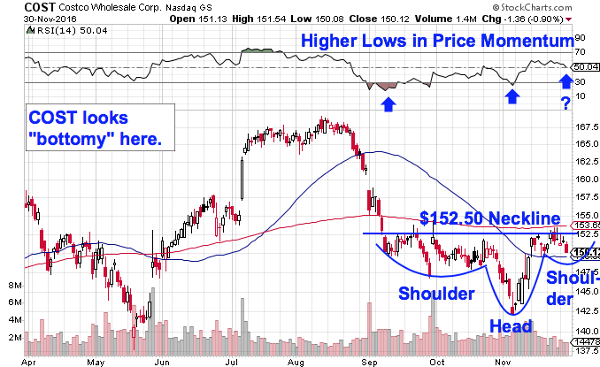 Since September, Costco has been forming an inverse head and shoulders pattern, a setup that signals exhaustion among sellers. The pattern is formed by two swing lows that bottom out at approximately the same level (the shoulders), separated by a lower low (the head). The buy signal comes on a move through Costco's neckline, currently at $152.50. 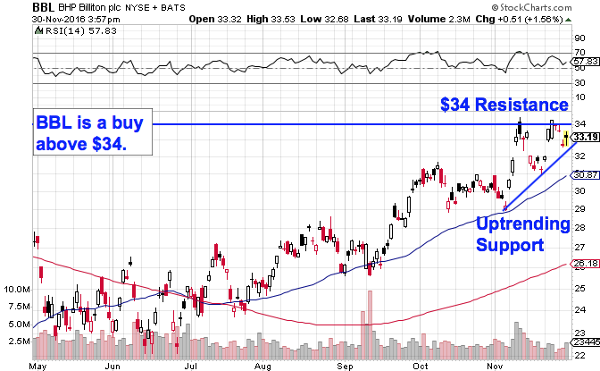 If Costco can catch a bid above $152.50, it's time to buy. Costco is a holding in Jim Cramer's Action Alerts PLUS Charitable Trust Portfolio. Want to be alerted before Cramer buys or sells COST? Learn more now. Price momentum, measured by 14-day RSI at the top of Costco's chart, adds some extra evidence that buying pressure is building right now. That's because our momentum gauge has been making a series of higher lows over the course of the inverse head and shoulders pattern, a bullish divergence that's a leading indicator of a change in Costco's trend. Keep a close eye on Costco in December -- shares are within striking distance of a breakout this winter. At the time of publication, the author had no positions in the stocks mentioned.